Stunning custom built home that is your own private oasis with picturesque views of pond and land! 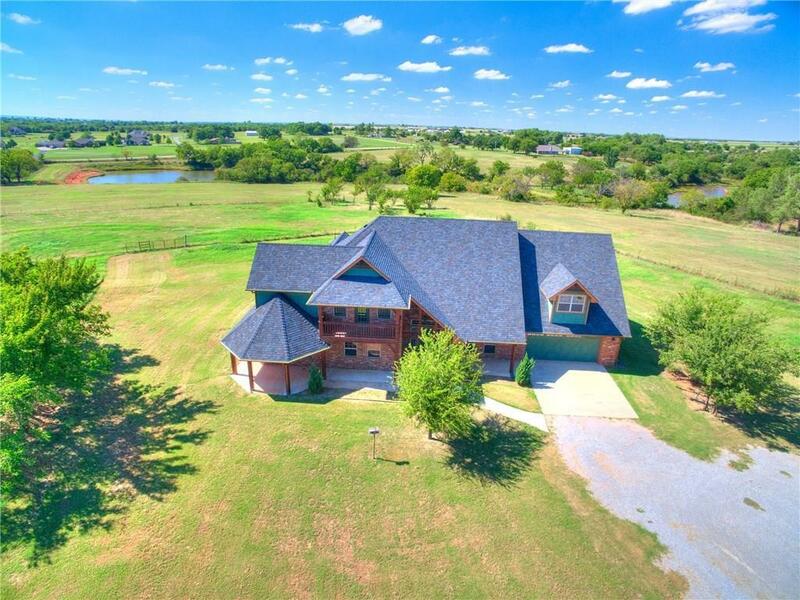 This home has tall ceilings with crown molding, gorgeous staircase, huge living room with custom stone fireplace, large formal dining, beautiful kitchen with gas range, built in microwave and butler's pantry with wine fridge. Wonderful master bedroom with a fireplace. Master bathroom has a separate shower, garden tub and large walk in closet. Upstairs loft could be a game room or 2nd living. Art room with half bath that is accessible through the garage and could also be used as guest quarters. 50X40 shop building with large living quarters. (2 bed, 1 bath with kitchen and living area), 10x20 heated and cooled tack room and a horse shower with hot and cold water. 16X30 dog kennel, large open patio with fireplace, grill and pizza oven. Two storm cellars, two septic systems, rural water and well water. Unfinished attic could be finished for a bonus room. Great property for livestock!